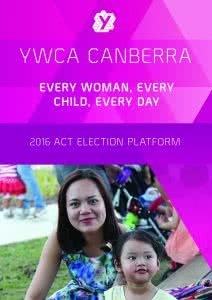 As an organisation committed to advocating for women and their families in the ACT, YWCA Canberra has taken an active approach to engaging with the ACT Government on issues of gender equality and social inclusion, throughout our history. In 2016, we launched our election advocacy platform, Every woman, every child, every day, calling on the next ACT Government to prioritise gender equality, support for children and young people, and community inclusion over the coming three years. The platform outlined 20 key areas for action, with practical, meaningful solutions that can be implemented to address areas of inequity in Canberra, through effective policy change and additional support. Throughout 2016, YWCA Canberra advocated consistently for the issues outlined in Every woman, every child, every day, through meetings with MLAs and candidates, digital advocacy to our networks, a special event for our members to meet female candidates running in the election, and by ensuring that our members were informed on each major party’s policies on gender equality and social inclusion prior to the election. In the lead up to the election, we ramped up our advocacy with the development and launch of an election scorecard, ranking each major party on their responses to five key issues facing Canberrans. On 1 August 2016, the Executive Director of YWCA Canberra, Frances Crimmins, wrote to ACT Labor, The Canberra Liberals and ACT Greens asking for their responses on five key policy issues that address selected issues from Every woman, every child, every day. The goal of our election scorecard was to ensure that our members and the broader public could make an informed decision at the voting booths, with an understanding of each party’s response to issues of social inclusion and gender equality. We consulted with each party closely in the development of the scorecard, and communicated the results to our membership and the public. You can read more about the scorecard process, outcomes, and download a copy of the full document here. We would like to thank our members, networks and the community for supporting our advocacy throughout the 2016 ACT election, and our supporters, for lending your voice to continue calling for gender equality and social inclusion in the Canberra community. We would also like to congratulate all Members elected to the Legislative Assembly – we look forward to continuing to work with you over the coming term. If you would like to get involved with YWCA Canberra’s advocacy, sign up to our e-newsletter or become a member, to hear about opportunities as they arise!